Upon entry you're greeted with a grand foyer. To the right of the foyer you'll find a bedroom and full bathroom downstairs, linen cabinet in the hallway, entry to the two car garage and to the left of the entry you'll find the entrance to the third car garage. Further on to the left you'll find the staircase leading upstairs and straight ahead you'll see the light and bright formal dining and living areas with a soaring ceiling. To the right of the formal living and dining areas you'll find the family room that opens to the kitchen with an exit to the lush landscaped backyard. The kitchen features cherry wood cabinets with a large center island and breakfast bar, non laminate countertops and tile backsplash. Appliances include, double ovens, refrigerator, dishwasher, built in microwave, and electric stove top. Off the family room you'll find the exit to the serene backyard that features a large covered patio, pavers, and mature landscaping. At the top of the stairs you'll find a light and bright loft area, perfect for a library, children's play area, or a large home office. Further on past the loft to the left you will find the large master bedroom complete with a private exit to a large balcony with a great view of the White Tank Mountains, and a large en suite bath complete with 2 walk in closets, double sinks, walk in shower, garden tub, and private toilet room. Further on to the right past the loft you'll find a hallway which leads to the upstairs laundry room complete with built-in cherrywood cabinets, small bonus room which has a built-in desk, the third bedroom, second guest bath, and the fourth bedroom. 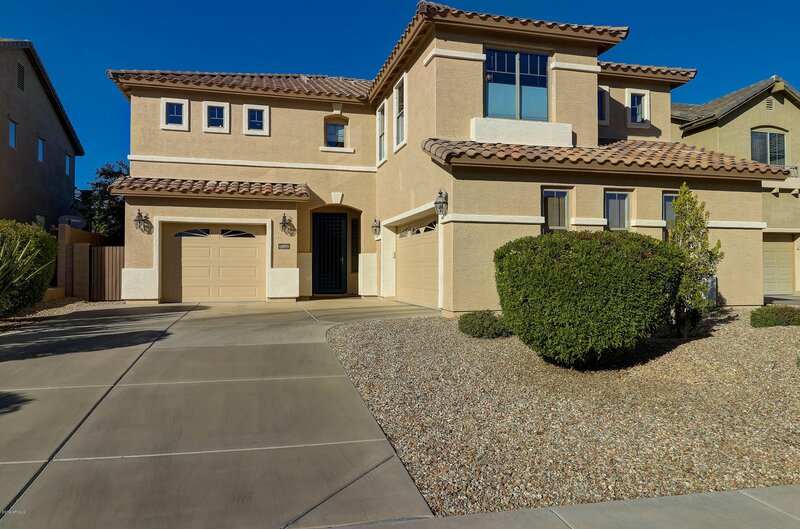 This beautiful turn key home has been meticulously taken care of and is waiting for its new owners!